I've long been an admirer of Anna's. Her sense of humor and imagination come together to create patterns you've probably never thought of, and will surely never find in any other pattern book. From the cute polluting smokestack to the wig-wearing pig, you're guaranteed to have fun. 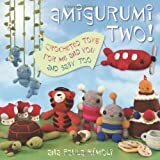 Anna also explains why you should knit toys in the first place, and helps guide you on your own path towards designing quirky creatures or anthropomorphic household objects. 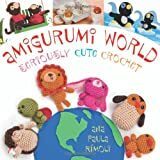 Written with humor and not at all dry, there are great photographs of knitting techniques, and explanations of how to customize your projects with different gauges of yarn and needle sizes. Totally unique and very thorough with a ton of useful information presented in a fun way. Greetingarts versions of Petite Pencil, page 127. Blogged. Ever wander into a yarn store, and see a skein or two of yarn that you just *have* to have, but then end up at a loss as to what to make out of it? This book is written for those of us who can't resist that one sale-priced skein, but are now left wondering what on earth to do with it. Obviously, it includes many scarves, hats and baby items, but it also has patterns for fingerless mitts, softies, cozies, felted bowls, purses, socks, even jewelry. The projects cover a range of skill levels, so can grow with you as a knitter. Divided into sections based on yarn weight, from lace to bulky, the book also includes patterns for novelty yarns, those fur or feather skeins and chain or ladder yarns that look great on the shelf but confound you when actually trying to find their way into a project. I like that the particular skein uesd for each project is listed at the beginning of the instructions, so you can compare their yardage to your own skein, and determine whether or not you have enough. However, all project photos are located in the front of the book, and not on the pattern page itself, so there's a bit of flipping around to locate the instructions. I did see one crochet pattern in the book, but I'm pretty sure everything else is knit. Blanket Buddy, photo page 26, pattern instructions page 207. Blogged. Lots of unique and fun toys, like a baby doll with removable diaper, stackable rattle rings, and mobiles. This book contains some very original ideas, very clever, with Ana Paula's characteristic cuteness. Great baby shower gifts, and fun things for both boys and girls. My version of Little Turtles, Eggs, and their Mommy on page 37. Blogged. This book has directions for elephants with skirts, a mommy and baby hedgehog, and anthropomorphic cups of coffee. Some of the projects are similar to one another, and once you get the basic shape down, just a few differences in ears or small details allows you to create a zoo of animals. There is a brief section at the beginning with illustrations showing the basics of crochet and simple embroidery stitches. My versions of the cafe con leche cup page 66. This book shows how to make softies of all kinds out of socks - pairs, or singles. I love the hand sewing emphasis, and the detailed, step-by-step instructions with large, clear photographs. Projects include a Lucky Cat, Little Red Pig, India Elephant, Punk Zebra and Bead-Eyed Hippo. Not all of the projects pictured in the book have specific directions, however, so be aware that you may not be able to immediately duplicate some of the achingly cute creatures seen in the gallery. This book does provide the basics, however, and even has an entire section dedicated to choosing the right sock for the softie you intend to make. Beatty, my version of the Long-eared Mini Doll page 92. Blogged.